Hoover senior Brooke Hoven. Journal file photos by Mark Almond. Chris Camper teaches social studies, but he knows a thing or two about chemistry, especially as it relates to team sports. As he embarks on his seventh season as Hoover’s volleyball coach, Camper believes he has the right blend of youth and experience to make the Bucs a Class 7A contender this season. That’s saying something since the Bucs reached the Elite Eight the past four years and advanced to the finals twice with a core group of players that included outside hitter Paige Shaw, setter Jamie Gregg and libero Savannah Gibbs. 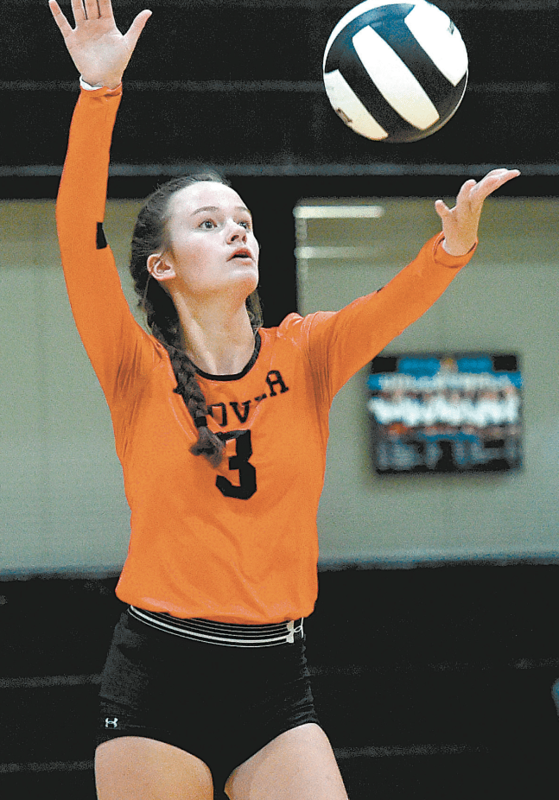 Those three, who were all named to the 2017 All Over the Mountain Journal Team, graduated along with Brayden Williams and Anna Marie Auchmuty after leading Hoover to a 31-10 season this past fall. The Bucs will have five seniors on the team this season, including three who saw considerable time on the court last year — setter Amiyah King, right-side hitter Caroline Raybon and outside hitter-defensive specialist MacKenzie Martin. The other two seniors are middle hitter Bayley Thornton and defensive specialist Brooke Hoven. Camper expects Hoven to miss most of the season because of a knee injury. Heading the Bucs’ strong group of young players are 6-foot-3-inch sophomore Gabrielle Essix and 5-foot-9-inch freshman Rya McKinnon. McKinnon’s dad, Ronald McKinnon, played in the NFL and is an assistant football coach at Miles College. “We’re expecting big things from Gabby,” Camper said. “She’s incredibly athletic. Two more sophomores expected to be big contributors are 6-foot-1-inch middle hitter Melodie Jones and setter Aly Durban. Jones is the younger sister of former Hoover star Maya Jones, and Durban’s mother, Michelle Durban, is the former Samford volleyball coach. Junior libero Amelia Auchmuty is expected to anchor the Bucs’ defense. Hoover will compete in a revamped Class 7A, Area 5 this season along with Oak Mountain, Thompson and Tuscaloosa County. Oak Mountain replaces Hoover arch-rival Vestavia Hills, which has moved to Area 6. Even without the Rebels, Camper expects Area 5 to be highly competitive. Hoover opens its season Aug. 23 at home against Vestavia Hills. The Bucs will visit cross-town rival Spain Park on Aug. 28. Camper isn’t making any predictions about how far the Bucs will go this season. He’s more concerned with how his team plays game in and game out. Look for volleyball previews of Briarwood, John Carroll, Mountain Brook, Oak Mountain, and Spain Park in our next issue.